Being a quality focused organization, we are engaged in manufacturing, supplying and exporting Corporate Gifts. 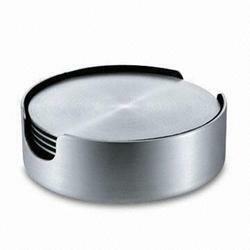 Under this range, we provide Corporate Gifts, Steel Coasters, Dry Fruit Storage Set, Diwali Gifts and many more. Offered gifts are provided to patrons in different shapes, designs and patterns so as to cater to their varied requirements. To ensure the higher level of patron satisfaction, we also provide these gifts with the brand names and logos printed on it. With an aim to stand tall on the expectations of patrons, we are engaged in offering a wide array of Steel Coasters. These steel coasters are in-compliance with the established quality standards due to which patrons are increasing their demand. In order to ensure the same, we manufacture these steel coasters by making use of the supreme quality steel, sourced from trusted vendors. In order to cater to the varied needs of patrons, we are engaged in offering a wide array of Amul Mixing Bowl in varied specifications. The demand of offered corporate gifts is high as these are manufactured by making use of the optimum quality raw material, sourced from trusted vendors, in-line with the prevailing trends of the industry. With firm commitment to quality, we are engaged in offering best grade array of Corporate Gifts. Made using quality assured raw at our sound manufacturing unit, offered corporate gifts are high in demand among patrons. 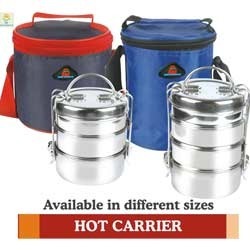 To fit the varied needs of patrons, we provide these corporate gifts as per their specified details. 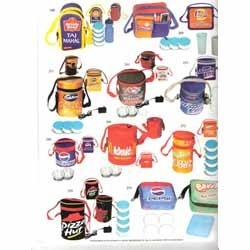 Our organization hold expertise in offering best grade array of Lunch Pack Gift Sets. 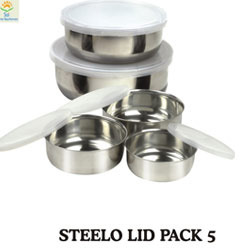 Our customers widely appreciate the offered festival gifts by making use of the quality assured steel and other material that is sourced from the trusted vendors of the industry. In addition to this, we keep in mind the widely followed quality standards while manufacturing these festival gifts. 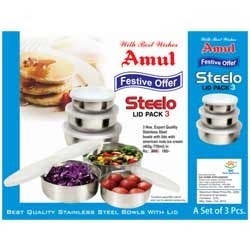 We are a leading name in this domain engaged in offering best grade array of Diwali Lunch Gift Sets. With an aim to make sure that our patrons are provided with supreme quality products, we manufacture these gifts by making use of the best grade steel while keeping in mind the industry set quality standards. Further, we check these gifts so as to ensure their flawlessness. "Item no. 7-diameter: 11 cm"
"Item no. 8-diameter: 12 cm"
"Item no.9 -diameter= 14 cm"